How many letters can you fit on a hair? At three p.m. on March 10, 2004, Christopher LaFratta, a doctoral student in John Fourkas's chemistry lab, wrote the word "hair" on a hair belonging to another lab worker, Vincent Chen '04. 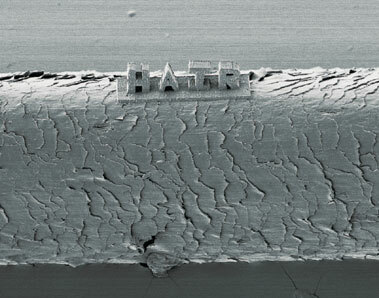 With the aid of a computer, LaFratta constructed the word in three-dimensional letters roughly 10 microns, or millionths of a meter, high. The point of the exercise was to test whether lasers can build tiny polymer structures on biological materials without harming the tissue. They can. That piece of typography is one of many complex objects that Fourkas, in collaboration with Professor of Physics Michael Naughton and Professors Malvin Teich and Bahaa Saleh of Boston University, have created with a technique called multiphoton absorption polymerization (MAP). In MAP, a laser beam shines through a microscope into an acrylic resin. Wherever the microscope focuses the beam, a light-sensitive chemical—a photoinitiator—begins a chain reaction that binds molecules into solid plastic. "It's the same kind of process as when you get a composite filling in a tooth, and they stick a UV light in your mouth," says Fourkas. But MAP happens on a much smaller scale: Each laser pulse creates a plastic building block just 140-billionths of a meter long. By laying down thousands of such "voxels" (as three-dimensional pixels are called) in a controlled pattern, then removing the leftover resin, "you can make absolutely anything," Fourkas says. In an article in the Journal of Applied Physics, the researchers reported creating pairs of pyramids linked by slim cables, interlocking square frames, and hollow bulbs—none larger than a few 10s of microns across—from globs of resin. These are of little use in themselves. But similar creations could find their way into miniature devices such as optical switches, 3-D computer chips, or even tiny surgeon-robots that would course through blood vessels like the submarine Proteus and her crew in Fantastic Voyage. Fourkas never expected that he could use his equipment to build directly on human tissue. "The light at the focal point of the laser is quite intense," he says. "So we were surprised that it didn't damage the hair." He credits the unusually high efficiency of his photoinitiator. "This means we can create polymer at relatively low laser power. With other photoinitiators, the power would have to be higher, so the hair might have been damaged. Also, hair turns out to be more resilient than we might have guessed." Now that the technique has been proven safe for human tissue, the biomedical possibilities seem endless. "You can think about attaching a little handle to a cell in a petri dish so you could grab it and pull it wherever you wanted," Fourkas says. "Or you could build a monitoring device that would let you know what was going on inside the cell. You could put an 'IV' on the cell and deliver specific drugs and watch how the cell reacts and how it interacts with other cells. Sky's the limit, really." All the more so once Fourkas takes delivery of an apparatus that, he hopes, will produce voxels just 10s of nanometers long (the current record, set in Japan, is 120 nanometers). Although Fourkas's is not the only group working on MAP, it may be the only one that applies the technique to cheap, readily available materials. Some researchers use proprietary resins that, Fourkas says, "are sort of black boxes—nobody will tell you what's in them, so you can't do anything to change the properties." Others brew specialty chemicals that are laborious to duplicate. "We wondered if there were materials out there whose properties we could tune to whatever applications we were pursuing," Fourkas says. For now, the winning blend—the one used for the "hair" sign—is a mix of commercial chemicals that are designed to resist shrinking and promote hardness, along with that highly efficient off-the-shelf photoinitiator. Now Fourkas has begun building structures that have moving parts and is developing ways to coat sections of objects with metals, which have properties polymers don't have, such as the ability to conduct electricity. One technique his lab is studying uses a polymer containing chemicals that release silver when struck by laser light. "We'd like to be able to create devices that incorporate mechanical properties, optical properties, electronic properties, magnetic properties," says Fourkas. And, of course, once he has built something useful, Fourkas would like to be able to replicate it easily. He and his group have that covered, too, and literally. They have slathered some of their tiny sculptures with a material called PDMS—"essentially bathtub caulk"—that forms a rubbery mold that can then be removed and filled with polymer to create an exact replica. "It would be much, much faster to produce structures this way," Fourkas says. "Just writing the word 'hair' took about an hour." David Brittan is a freelance writer and editor who lives in Newburyport, Massachusetts. Other members of John Fourkas's group are Richard Farrer, a post-doctoral researcher, and doctoral student Tommaso Baldacchini. Vincent Chen '04, who contributed a hair to the experiment, is now a doctoral student in chemistry at Georgia Tech.